Alright, so you don’t know how to talk to women (or even any other people who aren’t Lloyd, for that matter)! And you don’t know how to read maps! And you still haven’t figured out that sticking your tongue to a cold and frosty pole isn’t such a great idea! And you didn’t know that you can’t pay someone in IOUs! But you do know a good singalong when you hear one, and you know that you can’t triple stamp a double stamp. And that, my friend, is all valuable information that will moderately get you through an okay life! 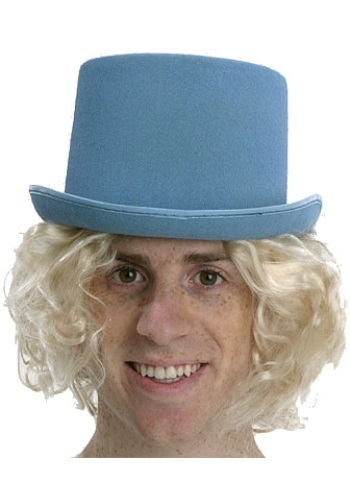 And, let's not forget that you, my friend, understand the importance of friendship...so when your best pal has another harebrained-yet-actually-kind-of-brilliant scheme in his head that requires formalwear, get dressed up in your best blue tuxedo, grab that blue tux hat, and finish off your look with this Blonde Harry Wig! Mock! Yeah!